Whether you're planning a big holiday meal or simply using meat or poultry from your freezer to make dinner, safe thawing is essential for avoiding food poisoning. When you freeze meat, you preserve the dormant bacteria currently on it. However, thawing the meat incorrectly by leaving it on the kitchen counter or placing it in hot water can reactivate harmful bacteria like Salmonella and E. coli. Learning safe thawing habits are important for the health of your family. According to the United States Department of Agriculture (USDA), there are only three ways you can safely thaw meat: in the refrigerator, in cold water, and in the microwave. Any other method risks portions of the meat becoming too warm and too hospitable for dangerous bacteria. The USDA describes any temperature between 40 degrees and 140 degrees Fahrenheit as the "danger zone," meaning these temperatures are ideal for bacteria growth. Even while you're thawing it, your meat or poultry should stay below 40 degrees Fahrenheit. You can safely thaw meat or poultry in the refrigerator because your fridge keeps its temperature between 35 and 40 degrees Fahrenheit. Refrigerator thawing requires some advanced planning, as it may take 24 hours to thaw a pound of ground beef or a package of chicken breasts. The time it takes to thaw your meat will depend on the size of the cut and the temperature of your fridge. It is safe to refreeze foods thawed in the refrigerator without cooking them first. Take the meat out of the freezer. Keep the meat in the package or put in a clean plastic bag. Place the meat in a dish so that when it thaws, the liquids do not drip on other foods. Put the meat in the refrigerator and monitor the progress. The next quickest method to thaw meat safely is using the cold-water method. It will take about 30 minutes per pound of meat when thawing in cold water. This method is convenient if you did not take the meat out of the freezer early enough to thaw before dinner. Although this method thaws the product faster than the refrigerator thawing method, it is more hands-on and requires more of your attention. It's also important to note that the USDA recommends immediately cooking meats thawed this way, rather than refreezing these items. Fill the kitchen sink or a large bowl with cold water. Do not use hot or warm water; this can cause bacteria to grow. Place the frozen meat in a leak-proof bag or package so it won't absorb sink water or produce a watery-tasting meat product. Submerge the package of meat in the water. Change the water to new cold water every 30 minutes. The microwave is the fastest method of thawing meat safely, but it can also result in partial cooking of your food. Since microwaves tend to cook things unevenly, some of your meat may reach danger zone temperatures and will require immediate cooking. Never refreeze meat thawed this way. Remove plastic wrap or Styrofoam packaging from your meat. Place it on a microwave safe dish. Program your microwave according to instructions. Start the microwave. 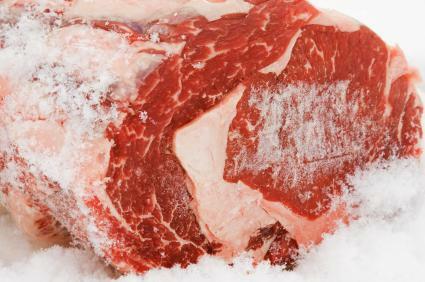 Check your meat frequently to monitor the thawing. You may need to turn the dish or stir the pieces of meat from time to time. According to the USDA, thawing your turkey in the refrigerator is the best method. If you are in a pinch and the turkey is not completely thawed, the cold-water method is acceptable. Remember, when thawing turkey in the refrigerator; place your turkey on a dish so the thawing juices do not drip on other food. You'll have to plan in advance for thawing your turkey in the refrigerator as it can take several days. Because of the size of a turkey or large piece of meat, thawing in the microwave is usually impractical. Use this chart to plan ahead. If you do not like the taste of microwaved meat and don't have time to use one of the other methods of thawing, you can cook food in its frozen state. According to meatsafety.org, cooking frozen meat takes approximately 50 percent longer than thawed meat. Wash your hands after handling meat, whether it is frozen or thawed. Always thoroughly wash your hands before touching other parts of the meal, such as salads, vegetables, and other side dishes. Wash the countertops and kitchen surfaces if the meat came in contact with them. Use bleach to sterilize cutting boards, and wash any meat-thawing dishes in hot water. Do not put cooked meat back into the container the raw meat was thawed in. To avoid thawing, go to the store and buy your meat fresh and unfrozen; store it in the refrigerator for the days allowed on the package. Although it may be tempting to thaw your meat in hot water or on the counter, safety is more important than convenience. Take the time to defrost your meat the right way so your meal will be delicious instead of dangerous.